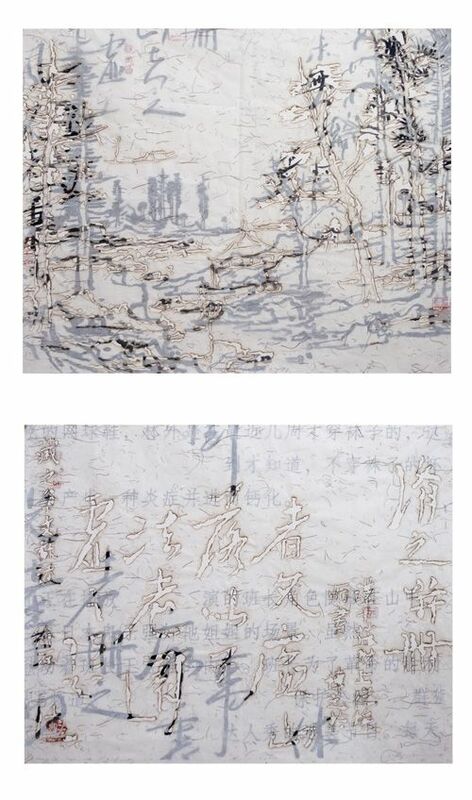 Chambers Fine Art Beijing will open Wang Tiande’s solo exhibition 3,720: Recent Works by Wang Tiande on September 18. Wang Tiande recently received his Ph.D. in calligraphy from the renowned China Academy of Art in Hangzhou, and holds the position of Dean and Professor at the Art and Design Department in Fudan University, Shanghai. Wang Tiande is best known for his art creations that incorporate traditional Chinese ink and brush and cigarette-burn marks, but for his first solo show in Beijing Wang he incorporates materials related to his recent interest in literature. In March 2009 Wang was visiting artist at the University of Kansas and often walked back and forth to the Spencer Museum of Art. Observing people exercising, jogging and walking at different speeds, he envisioned writing a novel which eventually became the subject of the present exhibition he titled 3,720. In the novel, the main character Lin Wai takes a walk every night after work from his home to a nearby park. One day he counts the number of steps he takes during the walk and discovers that the number is 3,720. From that day on he tries to repeat the number every time he takes the walk but as a result of all kinds of unexpected distractions and incidents never achieves the same number again. The story comments on the uncertainty of an ordinary life, which on its surface consists of repetitive actions but is always subject to unexpected diversions. During the course of the novel, Lin Wai’s career changes from a journalist at a state-owned publishing house to an entrepreneur of a photo studio. The story of Lin Wai can be read as a distillation of the lives of millions of Chinese citizens, whose lives went through dramatic changes when the country abandoned socialism as it turned towards a market-oriented economy. For one of the galleries in the Beijing exhibition Wang Tiande has created a series of ink drawings and sketches to accompany and illustrate the novel. The gallery is set up as a reading room with sofas and chairs, where visitors are encouraged to sit down, read the novel, and enjoy his artwork. In the other gallery recent examples of his signature landscapes will also be exhibited.